The Banded elm bark beetle (Scolytus schevyrewi) has the ability to attack, weaken and directly or indirectly kill a broad range of trees. It has been found in twenty-one Wyoming counties. Traps have been placed throughout twenty-three counties in Wyoming. Wyoming is no longer a targeted bark beetle, and only when it is found in a new county in our bark beetle traps, is it recorded. The lure used to attract Scolytus schevyrewi also attracts Scolytus multistriatus (the Smaller European Elm Bark Beetle). 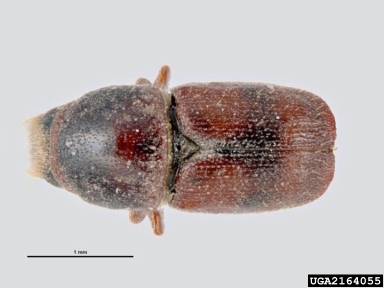 The National Woodboring Bark Beetle Survey in Wyoming is conducted by USDA APHIS PPQ. A Lindgren funnel trap with various lure attractants is placed in a potential risk area from May until September. The traps are monitored for suspects and serviced once a month. If suspects are found they are sent to the University of Oregon for further identification.